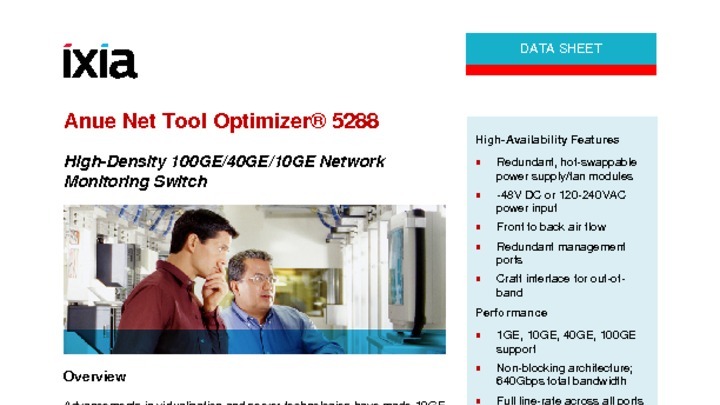 Ixia's Net Tool Optimizer® (NTO) 5288 is a high-density 10G / 40G / 100G network monitoring switch designed for large, complex data centers. This robust and highly efficient solution enables monitoring of the rapidly expanding numbers of 1GE, 10GE, 40GE, and 100GE ports using existing monitoring tools. Aggregating data from multiple visibility points in the network, the 5288 ensures delivery of critical network traffic to the appropriate monitoring tools. By enhancing the performance of these network and security monitoring tools, companies improve network performance, increase operation team productivity and reduce the risk of network outages. As advances in virtualization and server technologies make 10GE increasingly pervasive in large enterprise data centers, the transition to 40GE and 100GE is not far behind. The Net Tool Optimizer® (NTO) 5288 provides up to 64 10GE ports, 16 40GE ports, or 4 100GE ports in a compact 2U form factor.